The 1947 Fort Lauderdale hurricane was an intense tropical cyclone that affected the Bahamas, southernmost Florida, and the Gulf Coast of the United States in September 1947. The fourth Atlantic tropical cyclone of the year, it formed in the eastern Atlantic Ocean on September 4, becoming a hurricane, the third of the 1947 Atlantic hurricane season, less than a day later. After moving south by west for the next four days, it turned to the northwest and rapidly attained strength beginning on September 9. It reached a peak intensity of 145 mph (233 km/h) on September 15 while approaching the Bahamas. In spite of contemporaneous forecasts that predicted a strike farther north, the storm then turned to the west and poised to strike South Florida, crossing first the northern Bahamas at peak intensity. In the Bahamas, the storm produced a large storm surge and heavy damage, but with no reported fatalities. A day later, the storm struck South Florida as a Category 4 hurricane, its eye becoming the first and only of a major hurricane to strike Fort Lauderdale. In Florida, advance warnings and stringent building codes were credited with minimizing structural damage and reducing loss of life to 17 people, but nevertheless widespread flooding and coastal damage resulted from heavy rainfall and high tides. Many vegetable plantings, citrus groves, and cattle were submerged or drowned as the storm exacerbated already high water levels and briefly threatened to breach the dikes surrounding Lake Okeechobee. However, the dikes held firm, and evacuations were otherwise credited with minimizing the potential death toll. On the west coast of the state, the storm caused further flooding, extensive damage south of the Tampa Bay Area, and the loss of a ship at sea. On September 18, the hurricane entered the Gulf of Mexico and threatened the Florida Panhandle, but later its track moved farther west than expected, ultimately leading to a landfall southeast of New Orleans, Louisiana. Upon making landfall, the storm killed 34 people on the Gulf Coast of the United States and produced a storm tide as high as 15.2 ft (4.6 m), flooding millions of square miles and destroying thousands of homes. The storm was the first major hurricane to test Greater New Orleans since 1915, and the widespread flooding that resulted spurred flood-protection legislation and an enlarged levee system to safeguard the flood-prone area. In all, the powerful storm killed 51 people and caused $110 million (1947 US$) in damage. Aransas National Wildlife Refuge is a 114,657 acre (464 km2) protected area situated on the southwest side of San Antonio Bay along the Gulf Coast of the U.S. state of Texas. It is located in parts of Aransas, Refugio, and Calhoun counties. The Aransas National Wildlife Refuge was established by Executive Order 7784 on 31 December 1937 by President Franklin D. Roosevelt as the Aransas Migratory Waterfowl Refuge as a refuge and breeding ground for migratory birds and other wildlife. Roosevelt issued a proclamation in 1940 changing the name to the Aransas National Wildlife Refuge.In October 1938, Civilian Conservation Corps Company 880 established camp south of Austwell, Texas. They built roads, ditches, firebreaks, and the residence facilities for the refuge. They constructed part of the spillway for Burgentine Lake, which serves as a major resting area for migratory waterfowl. They also graded the road to Austwell.Bird life includes ducks, herons, egrets, ibises, roseate spoonbills, and the endangered whooping crane, whose population has recovered significantly since the 1940s. Other fauna include American alligators, collared peccaries, snakes, and bobcats, which inhabit the refuge's grasslands, blackjack oak thickets, freshwater ponds, and marshes. The Florida Suncoast is a local marketing name for the west-central peninsular Florida coastal area, also sometimes known as Florida's Beach communities. The region contains more than twenty miles of Gulf of Mexico beaches and the warm, sunny winter climate attracts tourist from across the USA, Canada, and Europe. The phrase was coined in 1952 by St. Petersburg, Florida, mayor Samuel G. Johnson. Florida's Forgotten Coast is a registered trademark, coined in the early 1990s, by the Apalachicola Bay Chamber of Commerce. The name is most commonly used to refer to a relatively quiet, undeveloped and largely uninhabited section of coastline stretching from Mexico Beach on the Gulf of Mexico to St. Marks on Apalachee Bay in the U.S. state of Florida. The nearest major cities are Tallahassee, about 90 miles (145 km) northeast of Apalachicola, and Panama City, home of Tyndall Air Force Base, about 60 miles (95 km) to the northwest. Grand Bay National Wildlife Refuge was established in 1992 under the Emergency Wetlands Resources Act of 1986 to protect one of the largest expanses of undisturbed pine savanna habitats in the Gulf Coastal Plain region. The refuge is located near Grand Bay, Alabama in Mobile County, Alabama and Jackson County, Mississippi, and when complete will encompass over 32,000 acres (130 km2). The refuge is part of the National Wildlife Refuge system. The Refuge Complex Manager also administers the Mississippi Sandhill Crane National Wildlife Refuge and Bon Secour National Wildlife Refuge. Access to refuge lands (especially interior portions) is limited, but is available mostly on the Mississippi side and by boat. Gulf Coast Council of the Boy Scouts of America serves over 20,000 youth in traditional Scouting and in Learning for Life programs 11 counties of the Florida panhandle and 3 counties in Alabama. The council office located in Pensacola, Florida. The council's name refers to the Gulf Coast of the United States. The Gulf Intracoastal Waterway is the portion of the Intracoastal Waterway located along the Gulf Coast of the United States. It is a navigable inland waterway running approximately 1,050 mi (1,690 km) from Carrabelle, Florida, to Brownsville, Texas. The waterway provides a channel with a controlling depth of 12 ft (3.7 m), designed primarily for barge transportation. Although the U.S. government proposals for such a waterway were made in the early 19th century, the Gulf Intracoastal Waterway was not completed until 1949. The Mississippi Sandhill Crane National Wildlife Refuge was established in 1975 to safeguard the endangered Mississippi sandhill crane and its unique disappearing wet pine savanna habitat. The refuge consists of more than 19,000 acres (77 km2) in four units and is now part of the Gulf Coast National Wildlife Refuge Complex. The Refuge Complex Manager also administers Grand Bay National Wildlife Refuge (Mississippi/Alabama) and Bon Secour National Wildlife Refuge (Alabama). The Mississippi Sound is a sound along the Gulf Coast of the United States. It runs east-west along the southern coasts of Mississippi and Alabama, from Waveland, Mississippi, to the Dauphin Island Bridge, a distance of about 145 kilometers (90 mi). The sound is bordered on its southern edge by the barrier islands - Cat, Ship, Horn, West Petit Bois (formerly known as Sand Island), Petit Bois, and Dauphin. Ship, Horn, West Petit Bois and Petit Bois Islands are part of the National Park Service's Gulf Islands National Seashore. Those islands separate the sound from the Gulf of Mexico. The sediment of the islands was created partly by the ancient Mississippi River when the St. Bernard Lobe of the Mississippi Delta was active over two thousand years ago. The expansion of the St. Bernard subdelta slowly isolated the Mississippi Sound from ocean dynamics of the open Gulf of Mexico.Traditional seafood harvests, particularly shellfish, have been curtailed recently due to declines in numbers and quality caused by pollution and weather related events such as hurricanes, flooding, or droughts. Federal and state authorities have various programs and regulations aimed at shellfish restoration and water quality monitoring for beachgoers. After the 2008 and 2011 openings of the floodgates of the Bonnet Carré Spillway the massive freshwater destroyed the oyster and crab populations and the authorities have undertaken cultch plantings to restore the fisheries in the western sound. Sport fishing is year-round on charters as well as the nearshore.Large portions of the Mississippi Sound reach depths of about 6 meters (20 ft). Part of the Gulf Intracoastal Waterway traverses the sound with a project depth of 3.6 meters (12 ft). The waterway, maintained by the US Army Corps of Engineers, is designed for towboat and barge traffic. Most of its route through the sound is merely an imaginary line through water whose depth exceeds the project depth. A section west of Cat Island and the portion north of Dauphin Island rely on dredged channels marked by aids to navigation maintained by the US Coast Guard. The Pascagoula River and the Pearl River flow into the sound. The RSA Battle House Tower is located in Mobile, Alabama and is Alabama's tallest building. The building is owned by the Retirement Systems of Alabama (RSA). It is the tallest on the Gulf Coast of the United States outside Houston. It replaces the Wells Fargo Tower in Birmingham as the tallest building in Alabama and the RSA–BankTrust Building as the tallest in Mobile. The building is named for the neighboring Battle House Hotel, which is now part of the tower complex. The Battle House Hotel was restored and renovated as part of the tower project. Sabine Lake is a 90,000-acre (36,000 ha) saltwater estuary on the Texas-Louisiana border. The lake, some 14 miles (23 km) long and 7 miles (11 km) wide, is formed by the confluence of the Neches and Sabine rivers. Through its tidal outlet 5 miles (8 km) long, Sabine Pass, Sabine Lake drains some 50,000 square miles (100,000 km2) of Texas and Louisiana into the Gulf of Mexico. The lake borders Jefferson County, Texas, Orange County, Texas, Cameron Parish, Louisiana, and the city of Port Arthur, Texas. 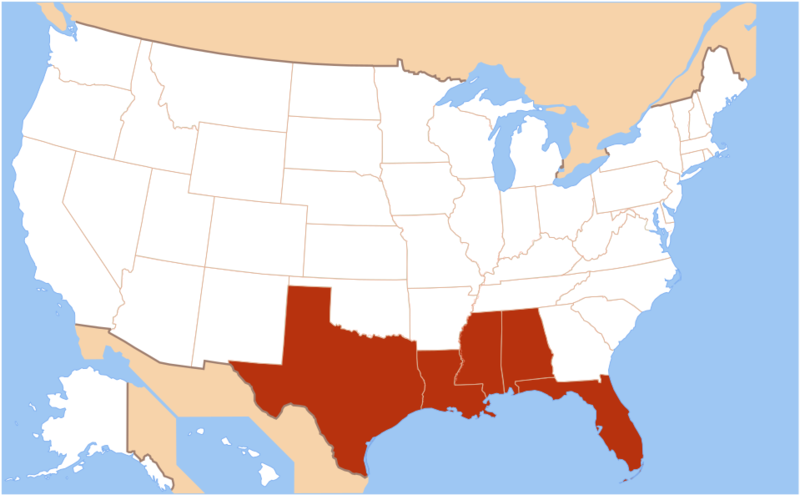 The Tamaulipan mezquital ecoregion, in the deserts and xeric shrublands biome, is located in the southern United States and northeastern Mexico. It covers an area of 141,500 km2 (54,600 sq mi), encompassing a portion of the Gulf Coastal Plain in southern Texas, northern Tamaulipas, northeastern Coahuila, and part of Nuevo León. Third Coast is an American colloquialism used to describe coastal regions distinct from the West Coast and the East Coast of the United States. Generally, the term "Third Coast" refers to either the Great Lakes region or the Gulf Coast of the United States.Considering its Great Lakes coasts, Michigan has the 8th most miles of shoreline of the lower 48 states and more fresh water shoreline than any other state. Many regional businesses incorporate the term "Third Coast" in their names and products, such as Michigan's Third Coast Kite and Hobby, which has an image of the coastal dunes in its logo, and Texas-based Third Coast Coffee. Xiphopenaeus kroyeri, commonly called the Atlantic seabob, is a commercially important prawn. It is up to 140 mm (5.5 in) long and is the most intensely fished prawn species in the Guianas and along much of the Gulf Coast of the United States.